See the new Honda Civic Hatchback in Cartersville, Georgia. Our Ed Voyles Honda dealership has the all-new Honda Civic Hatchback in stock now. We are excited to offer this Civic as the first ever 5-door hatchback in LX, Sport, EX, EX-L, and Sport Touring trims. Powered by a 1.5-liter DOHC direct-injected turbocharged in-line 4-cylinder engine this new Civic delivers 174 horsepower and 162 lb.-ft. of torque ( LX, EX and EX-L trims). 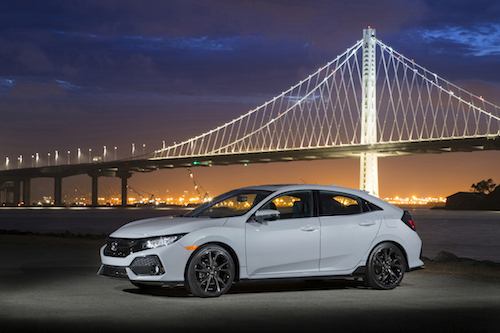 The new Sport Touring Civic Hatchback with CVT offers a peak output of 180 horsepower and 177 lb.-ft. of torque with 6-speed manual transmission model. Inside the new Honda Civic Hatchback are modern and sophisticated interior features. This model has also been designed to offer the most volume and cargo capacity in its class. With an interior space of 122.9 cu. ft., the best in class rear seat legroom and largest cargo carrying capacity available for a model of this size, the Civic Hatchback is one of the most comfortable and versatile models in the new Honda lineup. We are thrilled to offer this innovative new Honda Civic and have plenty of affordable financing options available. Frequent special offers and lease deals are offered to help you get behind the wheel of a new Honda Civic Hatchback in Cartersville, GA without breaking the bank. So why not stop by and take a test drive soon?